CCGB architects – Brian Cassidy – Artworks PHX – a business-arts campaign in Phoenix, Arizona USA. CCBG Architects Buchanan Building contributes to historic district through urban design. When people think about art, how often does a building come to mind? 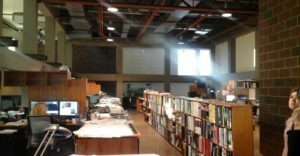 Unless you are a person who has an interest in all things involving city planning and building design, most people would look pass the art of designing and building a building like the Buchanan Building. CCBG Architects developed the Buchanan Building, located in the Warehouse District of Downtown Phoenix. The design of the building was planned to maximize space in a small footprint resulting in creative, cost-effective new construction that blends perfectly with existing historic warehouses. CCBG designed a building that would fit perfectly in the small piece of vacant land purchased from a prior property owner. 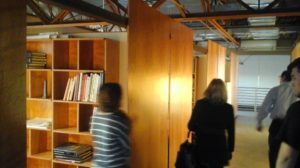 The firm’s architects designed and built the furniture, including desks, bookshelves, the conference room’s ceiling, and tables. The work space creates a vibrant atmosphere to keep employees excited about coming to work. The firm’s president, Brian Cassidy, believes the Buchanan Building provides a creative environment for productivity, while preserving the authentic look and feel of the city’s Warehouse District. Built in a blighted area of what was once a thriving retail produce Warehouse District in downtown Phoenix, this project seeks to “aid” in the reclamation of a unique and endangered fragment of the cities past. The area, which served as a center of commerce dating back to the 19th century, had become a haven for crime by the 1970s. By the early 1990s, many historic buildings were systematically demolished to create parking lots for nearby sports venues. Attempts to stem the destruction and stimulate re-development resulted in lot accumulations and further destruction, clearing the way for “mega projects,” nearly all of which failed. 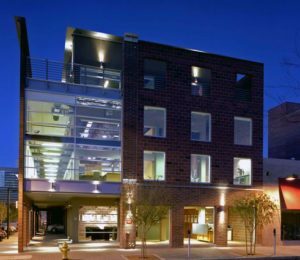 CCBG Architects many urban projects include the Union at Roosevelt, iLuminate, and Linear, all projects located near Roosevelt Row in the Downtown Phoenix arts district.